Brooks Brothers offers customers a variety of clothing for both men and women. Fun Fact: It is the oldest men’s clothier in the United States and is headquartered on Madison Avenue in Manhattan, New York City. Whether you are looking for shirts, pants, ties, blazers, suits, outerwear, sports coats and vests and more, you have come to the right place. These gifts arrives ready to use in a blue folder showing the amount of your gift, along with a copy of our latest catalog. A Gift Card is a stylish choice, appropriate for any gift-giving occasion. Personalize your gift by choosing from a number of designs and including your own message. It may be redeemed online, by phone, or at any Brooks Brothers store throughout the United States. An e-gift card arrives instantly or on your specified date, via email. Personalize your gift by choosing from a number of designs and including your own message. It may be redeemed online, by phone, or at any Brooks Brothers store throughout the United States. 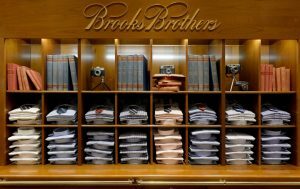 Brooks Brothers are proud to have become an institution that has shaped the American style of dress through fashion innovation, fine quality, personal service, and exceptional value in their products.